Today we are excited to announce a new feature that will enable you to monitor your Azure resources more effectively and take further actions on them, automatically. 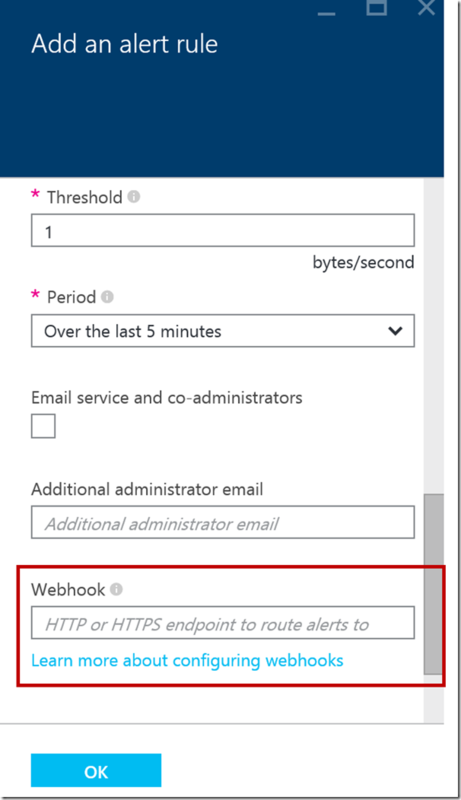 You now have webhook support for Azure Alerts on monitoring data (metrics) from your Azure resources. Integrate with popular DevOps notification & incident management systems such as PagerDuty, OpsGenie, VictorOps etc. 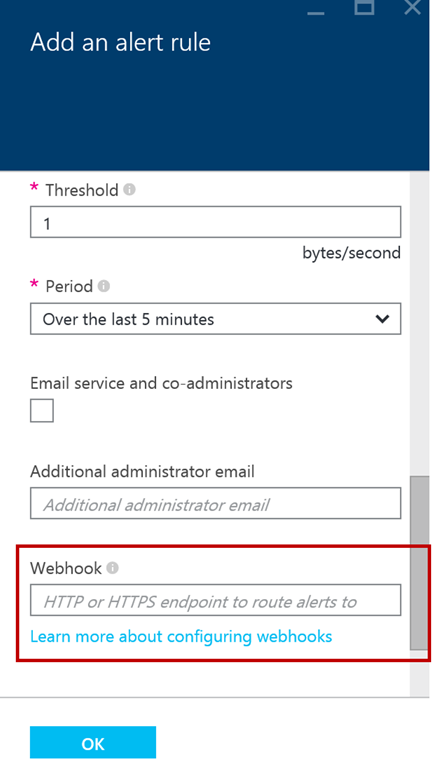 The JSON payload schema and configuration options in webhooks for Azure Alert is explained here on the Azure Documentation site. This document explains how to integrate Azure Alerts with OpsGenie. Logic App to send SMS via Twilio API. Create a Twilio account first. Logic App to send messages to an Azure Queue. Now that you have learnt how to do this via the Azure Portal, take a look at how to do this programmatically using the Azure Insights SDK. The advantage of using the SDK is that you can add custom properties to your webhook (key-value pairs) that get passed on with the JSON payload. The SDK also allows you to add multiple webhooks (up to 5) for your Azure Alert. We will support adding multiple webhooks via the Azure Portal in our next refresh. Here is a C# sample to get you started. So take this for a spin, fire away Azure Alerts to your favorite webhook and let us know what you think.